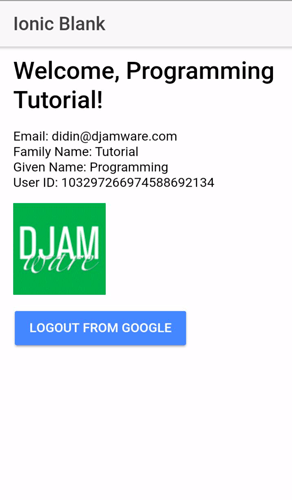 This is step by step tutorial Ionic 3 and Angular 4 app authentication with Ionic 3 native Google plus plugin. Before started with the app, there's a setup of Google Plus via Google Developer Console. 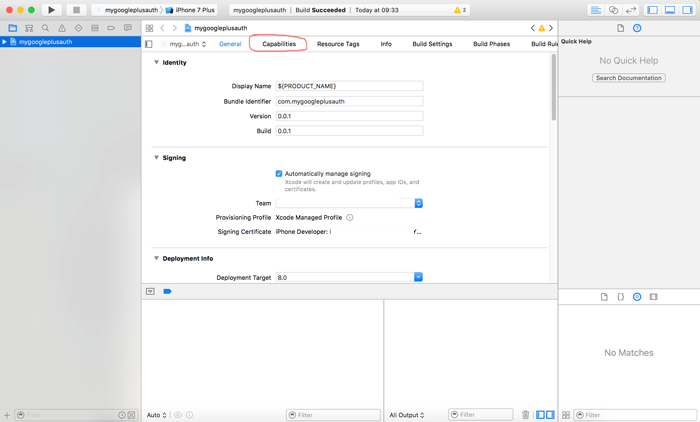 The first thing to setup from Google is generating configuration files for iOS and Android. For iOS, open your browser then point to this address then log in with your google account. Create the new iOS app from there by filling the form. Enter app name and iOS bundle ID, our example is "MyGooglePlusAuth" for app name and "com.mygoogleplusauth" for iOS bundle ID. Please, remember that iOS bundle ID will use in Ionic 3 config later and that would be easy if we use the same bundle ID for Android. Leave other option to default then click "Choose and Configure Service" button. Click "ENABLE GOOGLE SIGN IN" button. After that, click "Generate configuration file" button. Click the button "Download GoogleService-info.plist", we will use this files later on the Ionic 3 project. Next, we have to generate Google service configuration file for Android too. Go to this address then choose app name that previously created. 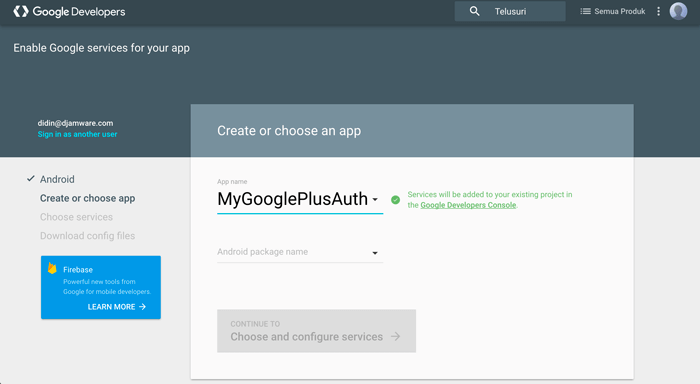 File Android package name same as iOS bundle ID "com.mygoogleplusauth". Click "Choose and configure service" button. Before enabling this service, we have to create new SHA-1 signing certificate which uses for release and debug. Open terminal or command line, then type this command to create certificate fingerprint for debugging. or from the command line (windows). Enter the password, by default for "debug.keystore is "android". 0010: 80 6E 67 01                                        .ng. Copy Certificate fingerprints SHA1 value then paste in "Android Signing Certificate SHA-1" of Google Developer to enable Google Sign-In service. Next, just click the "CLOSE" button and not necessary to download generated configuration files for Android only. If you plan to use your app in production/published, change the certificate fingerprint with this command. Keystore using same as your Keystore of build release for publishing. Then edit manually in Google developer console. Choose credentials from side menu then find "OAuth 2.0 client IDs" for Android. You can replace the SHA1 certificate fingerprint with production/release key. As usually in almost all of our tutorial, we create an app from scratch. Back to the terminal or command line then go to your apps folder. Type this command to create new Ionic 3 app. Now, open and edit config.xml in the root of app folder. Replace app id on the <widget> tag to match Android package or iOS bundle ID that previously created on the Google Developer page. Run the app, to make sure everything still on the path. If you see the Ionic 3 blank app page below then we ready to continue. For now, stop the app by push control+c at the same time. To install Ionic 3 native Google Plus plugin you can refer to the official Ionic Framework documentation. Back to the terminal or command line. Type this command to install Cordova plugin and ionic module of Google Plus plugin. You can find "REVERSED_CLIENT_ID" on generated "GoogleService-info.plist" file. If you see warning like below then we should update the "@ionic-native/core" module. npm WARN @ionic-native/google-plus@3.6.1 requires a peer of @ionic-native/core@^3.6.1 but none was installed. Update the @ionic-native/core module by type this commands. To implement Google authentication, we put Google login button to trigger Google Plus authentication. Open and edit "src/pages/home/home.ts" then replace all codes with this. Next, open and edit "src/pages/home/home.ts" then replace all codes with this. For android is really easy. Before run make sure we have to add Android platform. 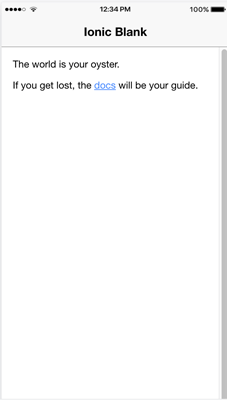 Then run the app on Android device, make sure you have connected your device to your computer. 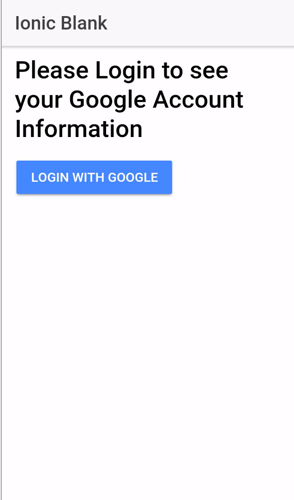 After clicking the button "Login With Google", it will show a dialog to choose your existing google credentials on the device. Choose one of it then it will back to the app with Google user detail. For iOS type this command. After the finished build, open the file with extension ".xcodeproj" on "/platforms/ios" folder using XCode. Click/highlight project name on the left pane, then choose Capabilities. 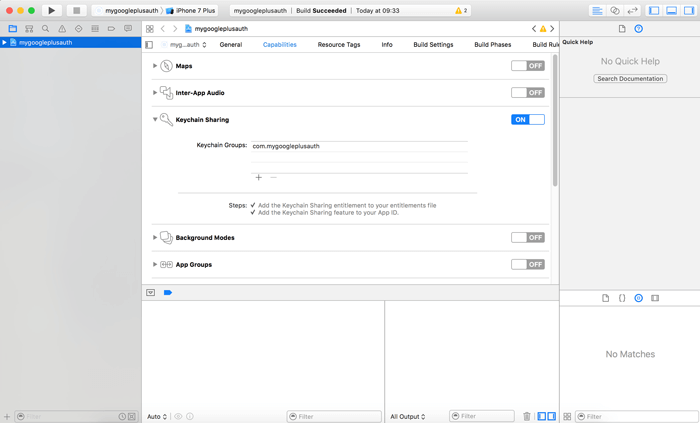 Turn on Keychain Sharing, for that you have to use your Apple developer account. Now, we can run the app to an iOS device from XCode, make sure there's a Google account on the device. That it's for now, you can find the full source code on GitHub.